Last year alone our library volunteers Kitty Wunderly and Ellen Peachy, both of whom have participated in training regarding the proper repair and restoration of library and archival materials, (along with fellow volunteer Bill Monsell) have repaired close to 1,000 books and other library materials. In the course of their curative duties we would often incur recurring costs for supplies (i.e. 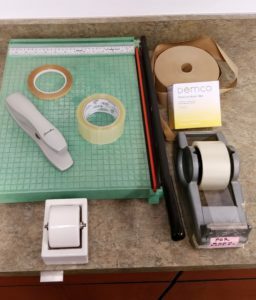 archival tape, special glues, book protectors, etc.) 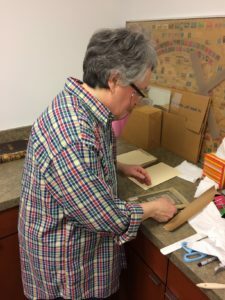 in order to support them in their work of maintaining the condition and thereby the ongoing availability of our library materials. 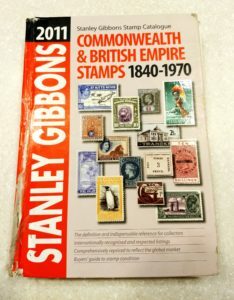 After reading previous PLR columns and this blog about possible funding for these efforts, the local stamp organization here in Central Pennsylvania, the Mount Nittany Philatelic Society (MNPS), decided at their January meeting to initiate this fund by giving $500 to the new APRL Book Restoration Fund. But their donation didn’t stop there. They also decided to match any further outside donations up to an additional $500. In other words, the MNPS has generously agreed to match any additional donations to the fund up to $500 and has put out the challenge to other clubs and societies, as well as individuals, to join them in supporting this book restoration and repair initiative at the APRL. If matched the fund would reach a grand total of $1500. The funds that the MNPS have donated will go a long way in enabling us to purchase the supplies we need, to continue the high standard of restorative work that our volunteers and staff perform, and will enable us to maintain a proper repair and restoration protocol for the library. We sincerely thank the MNPS for their generosity with this donation. 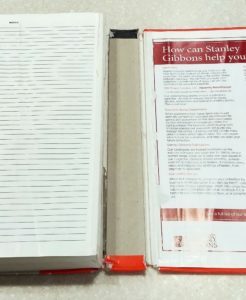 For those interested in donating to the APRL Book Restoration Fund and taking up the MNPS’ offer to match, they can contact the library at either stiffney@stamps.org or (814) 933-3816.